Today I found out how people swallow swords. But, don’t try this at home! If you always considered swallowing swords a gimmick, you may be surprised to find out that is not always the case. Besides the gimmicky acts where special trick swords are used or when performers prepare for the event by swallowing a metal tube, this amazing feat can actually be performed for real. It does however, involve special physical and psychological training. 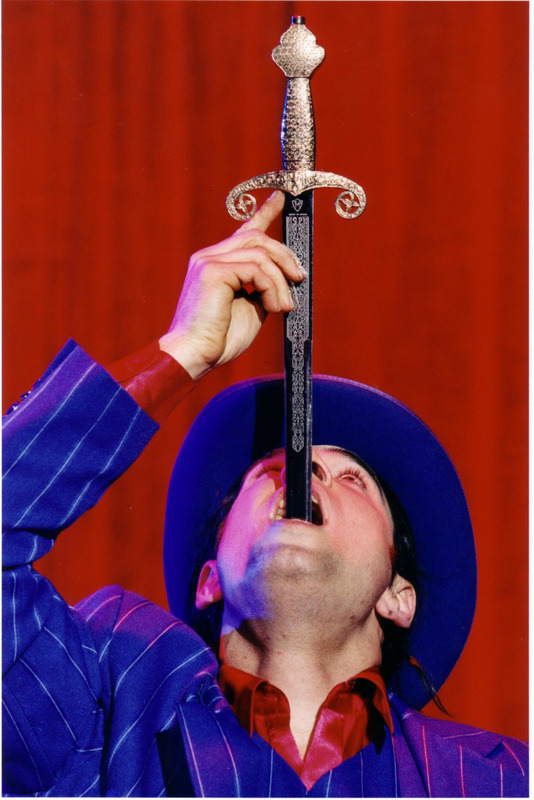 The act of sword swallowing is a complex process called ‘peristalsis’ which involves using up to 50 pairs of muscles in the throat. There is no actual ‘swallowing’ of the sword. Instead, the performer relaxes the throat enough to allow the blade to slide down the esophagus. In training to be able to do this, the sword swallower learns to introduce different kinds of objects into his throat for extended periods of time, before he moves on to swords or sharp objects. The trickiest part a sword swallower’s training is the correct placement of the sword. The blade should go passed the flipped open epiglottis, behind the prominentia laryngea (the voice box), past the pharynx, through the cricopharyngeus or upper esophageal sphincter, down the esophagus, and eventually through the lower esophageal sphincter. The blade goes through the diaphragm, past the liver, and to the bottom of the stomach at the duodenum. Most performers lubricate the sword with saliva, vegetable or olive oil to help the sliding down. What is essential and even more difficult, is the fact that the sword swallowers have to suppress the gag reflex and retch reflex. This is part of the psychological training they undergo. At first, performers usually hold their breath while repressing the gag reflex but later they learn how to breathe during the performance. Sword swallowers also usually bite down on the blade to prevent actual swallowing of the blade. For this they have to a certain mental attitude of conscious mind and body relaxation, to be completely aware of their movements and placing the blade the exact way. Even when a person masters sword swallowing, to a point where there is no pain from accidental cuts, it is still very uncomfortable act. The act takes years to master with practice. Sword swallowing was first introduced in India in 2000 BC where it was a demonstration of divinity and power. From there, it spread to China and Japan for theatrical performance. In order to become an approved member of the Sword Swallowers Association International, (yes there is one) they require you to swallow a blade around 15 to 20 inches in length. The Sword Swallowers Association International reports that there are several serious sword swallowing injuries requiring hospitalization each year, and even more of them go unreported. One of the sword swallower’s trick is to drink several glasses of water before performing. This makes the stomach sink lower so you can swallow longer length blades. Philadelphia’s Mütter Museum of human pathology contains thousands of objects, from umbrella tips to diminutive opera glasses, that have been swallowed by people accidentally or on purpose. I heard you could get by with a goldfish, Tiny Tim.